Nothing puts you in the holiday mood like a trip to the Pastega Christmas Light Display in Corvallis. Load the family up in the car on a cold winter evening, take a quick spin through your favorite local coffee shop (like Dutch Brothers or Coffee Culture) for hot chocolate, and head out to the Benton County Fairgrounds. 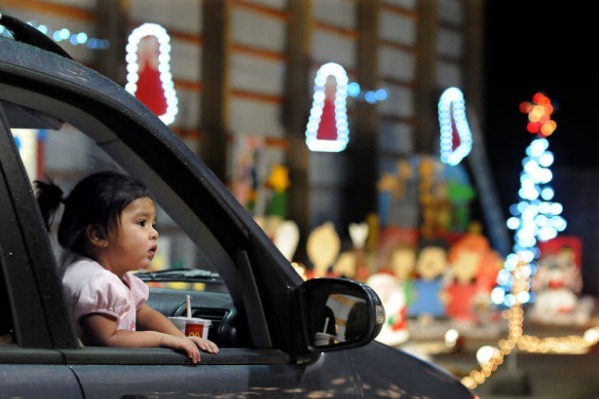 There, you and your family can enjoy a slow drive through a sea of holiday lights while enjoying Christmas music and more than 250 handcrafted, hand-painted figures and festive mechanized scenes. The Pastega Christmas Light Display has been a Christmas tradition in Corvallis since 1981. The Light Display was founded by Mario and Alma Pastega, and originally housed at their Pepsi Cola Bottling Plant. After Mario Pastega's passing in 2012, the Light Display was moved to the Fairgrounds and is now kept up by a small army of enthusiastic volunteers. The Pastega Christmas Light Display runs November 23, 2018 through January 1, 2019, nightly from 5 p.m. to 10 p.m. Admission is free, but they do ask for a canned food donation. Another Corvallis holiday tradition is the Corvallis Nativity Festival, a family-friendly celebration that offers five days of concerts and children's activities, along with a lovely display of hundreds of different nativity scenes, ranging from simple to whimsical to elegant to homemade. The Corvallis Nativity Festival is celebrating its 25th anniversary this year! The Nativity Festival happens November 30 through December 4, 2018, at 4141 NW Harrison Blvd. in Corvallis. Admission is free. If you're in a shopping mood, don't miss Winter's Eve Corvallis, another fine tradition, put on by the Assistance League of Corvallis. Each year they erect an elegant heated tent on Madison Avenue in Corvallis, between 2nd and 3rd Streets, and fill it with food, lights, music and holiday cheer. Browse specialty holiday food items for sale and take part in a silent auction with unique gift items and services. Local artist Jan Roberts Dominquez creates an original holiday painting for the event, which will be available for sale that night. Winter's Eve Corvallis happens Nov. 30, from 5 p.m. to 9:30 p.m., and tickets are $42.